We’ve been reporting for years that the labor markets in California and the nation are as healthy as they can possibly get, that anyone who wants a job can get one, and that technology has been the engine of growth during this expansion. The state just revised the jobs numbers for 2016 and 2017 that affirm all of this, and then some. The unemployment rate in California is the lowest since reliable records have been kept. My data for the state go back 50 years to 1968. Technology employment, though slowing down, is still the engine of growth in California and remains the fastest growing sector of the Bay Area economy. 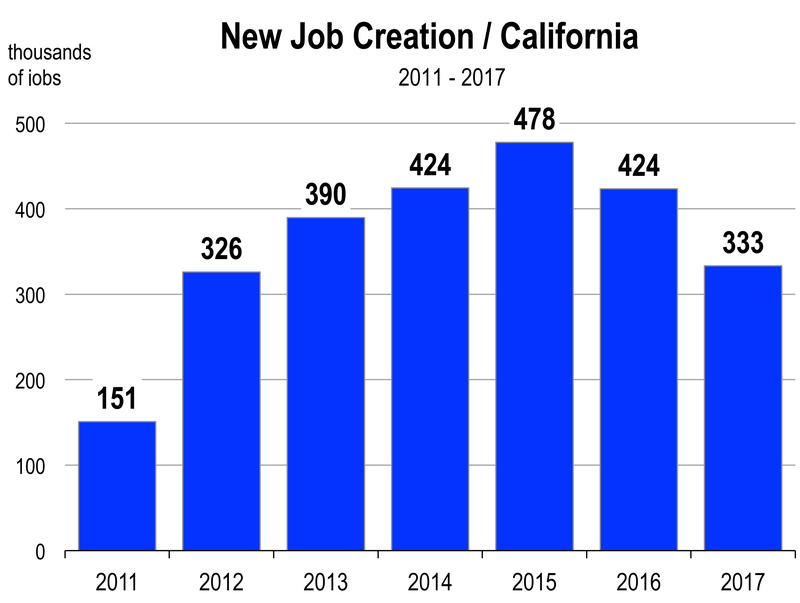 California created another 333,000 jobs in 2017, about 40,000 more than previously reported. My continued question about this is how can the state and its regions continue to produce more jobs when the unemployment rate says that the labor force is fully employed? The only way to create new jobs is for the labor force to expand. Now the labor force is merely the population, 16 years or older, that wants to and is able to work. The labor force expands when seniors graduate from high school or college and enter the job market, and when graduates complete graduate school. The labor force can also expand when people move to California from other states or countries, legally or illegally. So 126,000 people that were previously unemployed found work last year and another 218,000 new people entered the labor force and were employed. But this kind of scenario cannot continue much longer. At some point, the low unemployment rate will constrain employment growth and not just marginally like it has to date. The Robots are Coming. No They’re Actually Here Now. The tightness of California’s labor market is and will continue to manifest in onerous conditions for firms in recruiting new workers, higher wages and salaries, and more demands by workers for additional benefits, such as more paid time off, a better healthcare plan, or an office with a window. Rare conditions like these accelerate the incentives by firms to pursue substitutions for human labor with more capital intensive investments. And with the new tax bill, there are additional incentives to explore labor saving automation. You see, there is full and immediate depreciation of capital spending, including investments in technology and equipment (like robots) that could soon or ultimately replace workers. 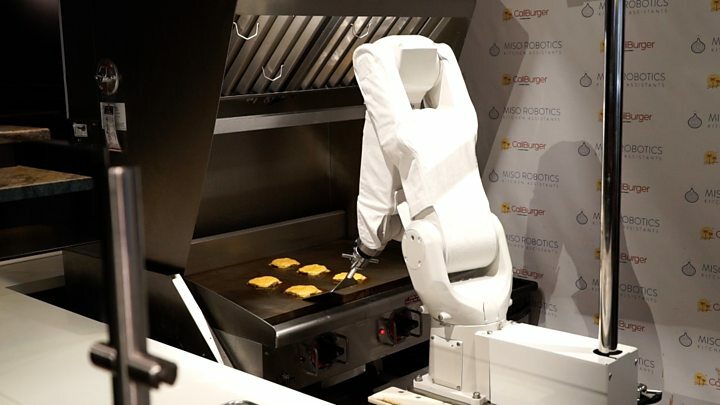 Consequently, with a fully employed and healthy economy in 2018, look for more news about the implementation of workplace robots, especially in the service industries. Take Flippy for example, who just this month started working at CaliBurger in Pasadena. The robot combines thermal vision, 3D vision and computer vision. Flippy can cook 150 burgers an hour, flipping them at the right time and removing them from the grill perfectly cooked. CaliBurger says more “Flippies” will be flipping burgers at multiple locations this year. 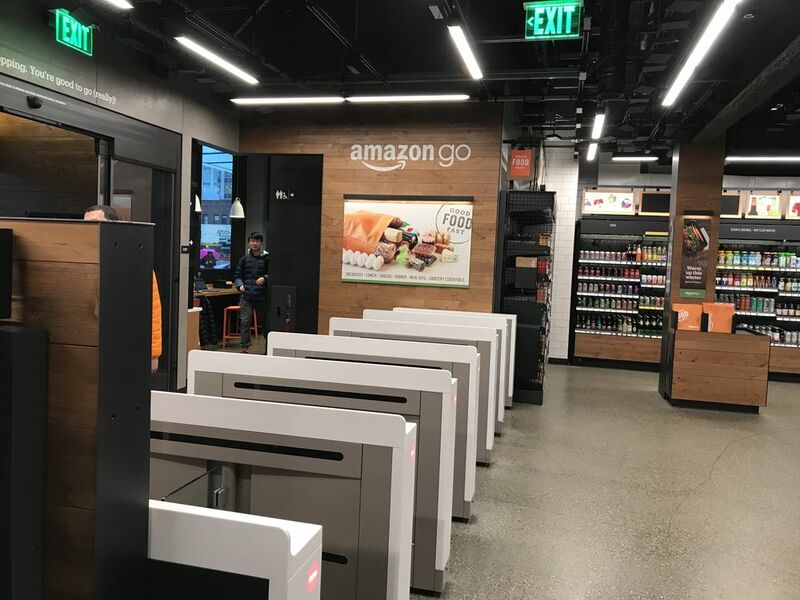 In late January, the first Amazon Go opened in Seattle. The convenience food store allows shoppers to scan their phone upon entrance, grab whatever items they want off the store shelves, and automatically get charged after exiting the store without needing to stop at a register. In fact, there are no registers and the only employees in the store are those that prepare fresh food, check IDs for beer and wine, and stock the shelves with merchandise. Not only does the new technology replace human cashiers, it eliminates the wait to check out which can often be as long or longer than the shopping time. Moreover, this new technology also renders shoplifting obsolete. Another Amazon Go is apparently being planned for a location in the Grove in Los Angeles later this year, with another 5 stores to open elsewhere. Since Amazon now owns Whole Foods, the “Go” technology might be headed that way in the not-to-distant future.